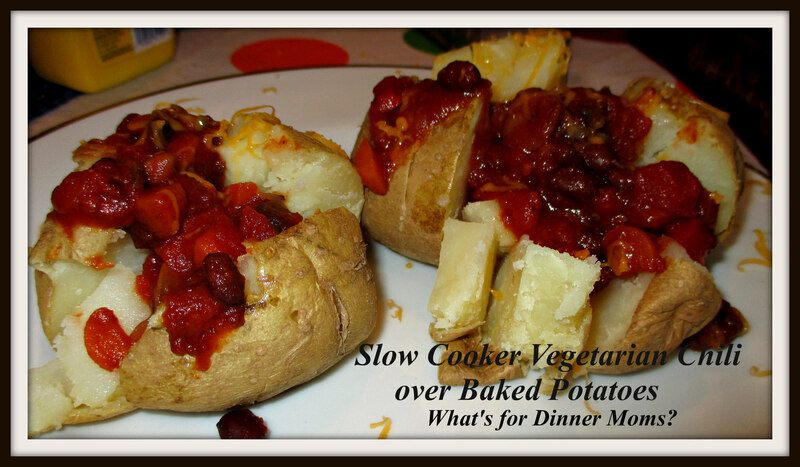 Slow Cooker Vegetarian Chili over Baked Potatoes – What's for Dinner Moms? The other day my son and I went out to lunch downtown at The Food District as a special treat. He chose Macaroni and Cheese with Crab and Lobster and I chose the OB Glad Foccacia Pizza. My pizza was bacon, sausage, pepperoni, onion and tomatoes on foccacia bread. Both dishes were amazing! I was able to get my fill of meat and my son was loving his vegetarian choice. If you are ever in Southwest Michigan I recommend stopping there for lunch or dinner. I am still trying to figure out this balancing act between his desire to eat vegetarian and everyone else’s desire to support him but still eat some meat. My daughter has been very good going along with me on just about everything I cook. Sometimes I add a little bit of meat, when I say little bit I may cook 1/4 to 1/2 pound for three people and still have leftovers, to a dish if appropriate. I am really trying to wean us all off from it but as above when I want to have meat I am trying to choose it only when eating out, which we very rarely do. For this dinner I added mushrooms and a bunch of veggies to my chili recipe. I HATE mushrooms! But, I thought that if I cooked them in the slow cooker with all the other vegetables and lots of spices I wouldn’t notice them so much and it would bulk up the chili recipe. I was trying to use all the leftover vegetables in my vegetable drawer so that I didn’t have anything go bad. I had baby carrots, mushrooms, a red pepper, onion and an eggplant. The only thing I didn’t throw in was the eggplant but I thought I could use that tomorrow in something. The best part of this dish was I made the leftovers into a completely different meal a couple of days later! I love the cook once, eat twice idea. We all loved this meal. I found out my son likes raw mushrooms but not cooked ones. But even he was surprised that he could see the mushrooms but there was so much flavor he didn’t even really taste them. His bean ban has been changed so that he now actually likes them. I ate mushrooms, carrots and summer squash and actually thought the whole mixture tasted good. I think this was a great shift forward in our becoming vegetarian family. I served this dish with a green side salad. This dish was gluten-free so my mostly gluten-free son ate the same meal we did. Mix all ingredients for chili in a large slow cooker. Cook for 8-10 hours on low. Prior to serving chili taste and adjust spices as needed. Bake potatoes in oven until fork tender. Cup open and sprinkle with cheddar cheese, pour vegetable chili over potato and top with sour cream, parsley or onions as desired. Pingback: Southwest Sauce over Spaghetti | What's for Dinner Moms? You really do my kind of food…yummy!